This portrait of the young boy-king Edward VI may be on an intimate scale, but no expense has been spared in the making of it. The scarlet of Edward’s doublet has been under-layed with silver leaf, giving it a shimmer to suggest the effect of ‘cloth of gold’. Cloth of gold was the fabric of kings; spun from genuine precious metal, it was woven using vertical (warp) threads of (red) silk, and horizontal (weft) threads of gold or silver. The resulting sheen was notoriously difficult to capture in paint, and the use of silver-leaf here beneath the crimson pigment is ingenious. Furthermore, the gold embroidery and chain of office have also been applied with gold leaf. Bonhams, London, 5 July 2017, lot 4. The costliness and dating of this portrait point to it as a contemporary likeness and commission from the Studio of William Scrots. The composition is a unique blend of elements from different likenesses of Edward by the artist. It loosely derives from his three-quarter-length portrait in the Royal Collection at Windsor Castle, c. 1547, (in which Edward wears an ostrich plumed cap and a gold embroidered tunic), and from the full-length, also in the Royal Collection, at Hampton Court Palace, c. 1550, where he is shown in a black and gold embroidered doublet and hose, and a jeweled cap without a plume. Our version has the young king in a plumed hat, uniquely bejeweled. His red and gold doublet is entirely different from both works, and he also wears a gold chain of office. Edward VI was born at Hampton Court on 12 October 1531, his mother Jane Seymour dying only twelve days later. The heir to the throne, ‘His Majesty’s most noble jewel’, was brought up with every precaution to ensure his good health. Recent research reveals him as a normally strong and healthy boy, fond of athletic exercises such as hunting and hawking. Edward was little more than nine when he succeeded to the throne on the death of his father in 1547. In April 1552 he suffered from measles and smallpox, recovering by the end of May, and thereafter he was very much under the influence of the Duke of Northumberland. However, early in 1553 Edward became ill with consumption, from which he never recovered. At this time the Duke of Northumberland convinced Edward to ‘devise’ the succession to Lady Jane Grey, Northumberland’s daughter-in-law. Edward died on 6 July 1553, and was buried at Whitehall. As the precious male heir to the Tudor dynasty, Edward’s childhood is very well documented through portraiture, in marked contrast to that of his half-sisters Mary and Elizabeth, whose iconography remained scarce until adulthood. His father was delighted with him; as a baby in May 1538 Henry was seen ‘dallying with him in his arms...and so holding him in a window to the sight and great comfort of the people.’ The earliest portrait of the young Prince was developed by Holbein, who had painted celebrated portraits of both Henry VIII and Jane Seymour, and who executed a drawing of Edward VI in circa 1539 – 1540, when he was only two years old (The Royal Collection, Windsor). This shows the young heir to the throne in a frontal and already authoritative princely pose, which Holbein later developed into a painted portrait, now in the National Gallery of Art, Washington. After Edward’s accession to the throne, he appears to have sat only once for his portrait in around 1550, painted by William Scrots. Scrots had recently inherited the mantle of ‘King’s Painter’ from Holbein in 1545, and at the Prince’s succession he oversaw in his studio the production of numerous portraits of Edward. This sitting was the likely source for all the subsequent variants, in all shapes and sizes, produced of Edward as King by the Scrots studio, both during the monarch’s brief reign and after Elizabeth I’s accession and the subsequent re-affirmation of the Protestant faith. Scrots had been court painter to the Regent of the Netherlands, Mary of Hungary, and was recruited by Henry VIII as Holbein’s successor at the close of 1545. 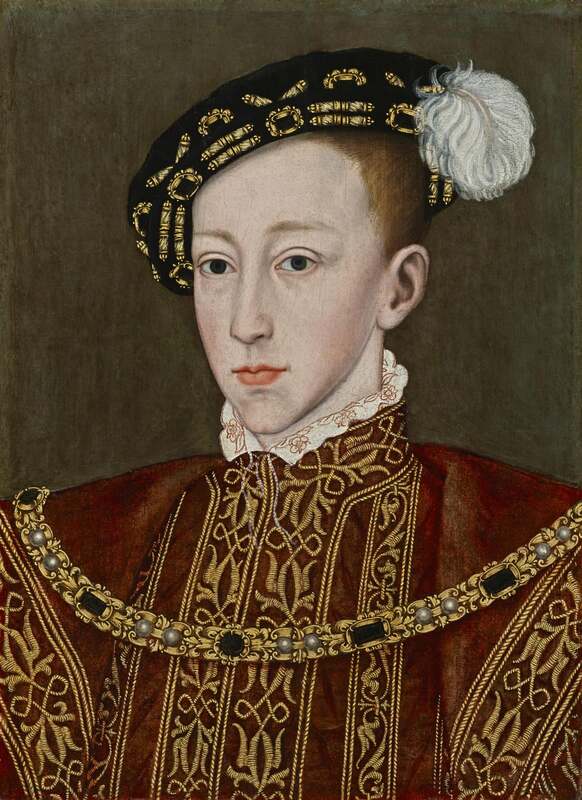 Although King Edward VI's reign was short, being only fifteen when he died of consumption, he displayed a deep interest in religious policy, and his reign is most notable for the continuation and consolidation of the English Reformation. He was hailed at his coronation by Thomas Cranmer (then Archbishop of Canterbury) as ‘a second Josias’. Cranmer urged Edward ‘to see Idolatry destroyed’ and ‘Images removed’ (Strype, Cranmer, 2.145). As early as July, 1547, the council had banned candles and shrines, and in 1548 images in stained-glass, wood, and stone were also forbidden. These purges, along with the anti-iconoclastic destruction of paintings and sculpture, soon saw the rich pictorial heritage of medieval Christianity largely obliterated. At the age of eleven, Edward was encouraged to compose a treatise in French on papal supremacy, denouncing the pope as ‘the true son of the devil, a bad man, an Antichrist and abominable tyrant.’ The young King’s religious education was rigorous, even relentless, but his fervour was not surprising given the immediate religious legacy of Henry VIII, if it were not for which Edward would never have been King. The young King’s actions were praised on the continent by European protestants, moves which his half-sister Mary, who succeeded him as Queen of England, was largely unable to reverse. Edward himself on his death-bed had opposed Mary's succession, not only on religious grounds but also on those of legitimacy and male inheritance, (which also applied to Elizabeth). He composed a document, ‘My devise for the succession’, in which he settled the Crown on his cousin Lady Jane Grey, who was married to Guildford Dudley, the younger son of Edward’s mentor, the Duke of Northumberland. Edward made his final appearance in public on 1 July, when he showed himself at his window in Greenwich Palace, and large crowds flocked to the palace in the hope of seeing him before his then pending demise. Only days later on the 6th July, 1553, he was dead. His last words were purportedly ‘I am faint; Lord have mercy upon me, and take my spirit’. He was buried in the Henry VII Chapel at Westminster Abbey on 8 August 1553, with reformed rites performed by Thomas Cranmer. At the same time, the new Queen Mary attended a mass for his soul in the Tower, where the Lady Jane Grey, having failed to rally popular support to her ill-advised claim, was already a prisoner prior to her execution. William Scrots, presumably of Flemish extraction, was first recorded in 1537 as court painter to Mary of Hungary, Regent of the Netherlands. However, none of his works before he came to England have been identified, and it is on the basis of his portraits at the Tudor court, most notably those of Edward VI, that attempts to construct his oeuvre have been made. He succeeded Holbein as King’s Painter in 1545 with what Roy Strong has observed as an extraordinarily high salary of £62 10s, over twice as much as Holbein’s stipend. His salary was stopped on King Edward's death in 1553, after which it is likely he left England. Scrots was an early exponent of the Mannerist style, which had originated in Florence and then spread through France to the Netherlands. His full-length of Edward, with its elongated figure and architectural background were typical of the style, and were first seen in his striking portrait of Henry Howard, Earl of Surrey, of 1546, in which the sitter was set against architectural statuary and emblems of classical sculpture. This was a conceit quite unlike any other seen in English portraits at the time, and which, as Ellis Waterhouse noted ‘could vie in modernity with those produced anywhere in northern Europe’. An iconic profile portrait of Edward VI by Scrots was also widely distributed around the same time as the present portrait type, in a similar plumed cap and ermine collared doublet, holding a pink carnation; it quite literally provided another princely angle from which to view the young heir. Another, signed profile portrait of Edward by Scrots was painted using the virtuosic technique of distorted or ‘anamorphic’ perspective (National Portrait Gallery, London). Later, when the painting was exhibited at Whitehall Palace in the winter of 1591–1592, it created a sensation, and important visitors were taken to view it. These kingly profiles represented one of the earliest incursions of the classical profile formula into English royal portraiture, influenced by the revival of secular portraiture and the cult of the medal, also seen in portraits by Holbein. Jennifer Loach, Edward VI, New Haven, 1999, p.8. MacCulloch, Tudor Church Militant: Edward VI and the Protestant Reformation, pp.26–7. Loach (ibid. ), p.167. See Foxe's Acts and monuments, VI, 352. Also known as Guillim Scrots (or Scrotes or Stretes). Strong, The English Icon, 1969, p.69.